Many Tierrasanta homeowners think that just because they have the standard Homeowner’s Insurance, they are covered in case of a flood. The reality is that you need a separate flood insurance policy and now is as good a time as any to get it. What’s more, just because floods happen suddenly, it doesn’t mean they should catch you off guard. Although the restoration and cleanup are best left to flood damage Tierrasanta professionals, there are some things you can do to help and others to avoid. It’s absolutely essential that you unplug all electricity-using devices in the flooded area, especially if the water reached the power outlets. To be on the safe side, you should also cut off the electricity powering these outlets by turning the main power source off. Unfortunately, it’s not uncommon for a basement to get flooded because of a burst pipe or slab leak. Since this type of damage comes from within your household, you can contain it more easily – by turning the compromised water source off. For example, in the case of a burst pipe, turn it off since this will help to contain the damage. 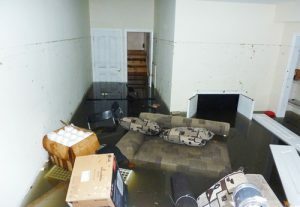 Flood damage usually gets the better of any carpet, but you can still salvage the furniture and curtains. Move whatever you can – chairs, tables, armchairs – away from the flooded area, especially if the furniture is made of wood. If some pieces are too heavy to move, you can at least pin up the upholstered furniture skirts, as well as long curtains, and move them away from the flooded part of the floor. Before you do any work, you should notify your flood insurance provider. Insurance providers are generally very strict when it comes to determining the liability for the damage, so it’s in your best interest to inform them if you are planning to mitigate the damage on your own or hire a professional to do it. As you can see, there are only so many things you can do to protect yourself, your family and your possessions in case of a flood. It’s highly unlikely that you would be able to troubleshoot the damage on your own, let alone do a thorough cleanup. Your responsibility should be to try and prevent the damage in the first place if possible, and follow the simple steps we have just laid out in case something unexpected happens. That is why you should have a reputable flood damage restoration company in Tierrasanta, such as KIC Restoration, on a speed dial. We are well aware of how common floods are in the area, and so we run a 24/7 emergency service. If you followed the steps we previously laid out, all your electrical devices are now unplugged and the power turned off, so you couldn’t possibly use the vacuum anyway. You can plug a wet/dry vacuum into an outlet but only on condition that it is far away from the flooded area. If that’s not possible, do not attempt to plug it in anywhere near the water. While this one may sound silly, it’s worth considering. If you put newspapers on the wet carpet, you risk the ink from the newspapers literally leaking into the carpet. What actually happens is that the wet carpet soaks in the ink, which can result in permanent stains. Don’t let a small oversight cost you the carpet that could otherwise be saved. You probably can’t avoid walking around the flooded area, especially if you want to move the furniture around and unplug all electrical devices. In this situation, most people forget to take off the dirty footwear when they leave the flooded area. Don’t make that mistake – even if the damage is not extensive and the amount of water is not massive, it can still be contaminated. Therefore, be extra careful not to contaminate the rest of your home.